The Grundfos SP range of submersible pumps is renowned for high efficiency and reliability. Made entirely of corrosion resistant stainless steel, the SP pumps are ideal for a wide variety of applications. 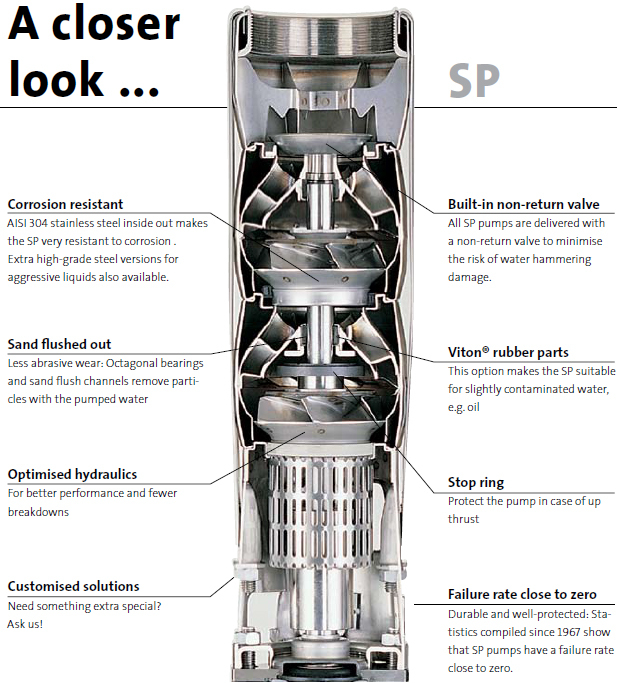 The Grundfos SP pumps represent state-of-the-art hydraulic design. Built to deliver optimum efficiency during periods of high demand, the SP pumps provide low long-term costs and high operating reliability regardless of the application. The SP range is your guarantee for a high-quality water supply. Capable of handling flows up to 470 m3/h and heads up to 810 m, the SP systems give you everything you need from a single supplier. A total system combines a stainless-steel SP submersible pump, an MS/MMS motor made specifically with submersible pump applications in mind, and an MP 204 motor protection unit for added reliability. The system package gives you complete peace of mind by making sure your water supply application works every time. And all the time.